Funds raised! Thank you, thank you! Thank you to all who donated and prayed us into a safe car for our whole family! We don't even know what to say. As we look around us it is hard to believe all the things God has given to us. A beautiful new son, whom we ADORE, wonderful friends and a thriving ministry, a home that sits on the outskirts of the game park and a vision for the future, it just doesn't get better. I giggle as I think back to the 12 year old girl sitting in her room telling The Lord, "I don't want to give you my life because I know you'll send me to Africa!" Ha! Our walk with Jesus in never boring and oh, so full of joy! We want to share an exciting opportunity we have to purchase a car that will be much more reliable and seat our now, family of SIX! We want to ask you to partner with us for the purchase. 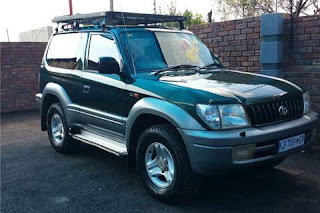 The car is a 2001 LandCruiser that seats 8. 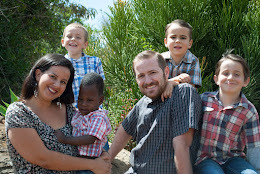 We are looking to buy the car from some missionaries who are leaving the field in August. We have currently raised about half the funds we need. We have about three more weeks to give the family a definite yes as they have graciously waited to see if we could raise the funds to purchase the car. Why a new car for the F6? 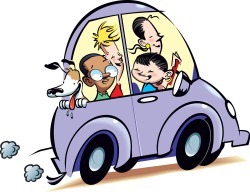 Our current car has undergone several maintenance repairs and is honestly not fit for the roads we drive as we frequently have to change flat tires, have suspension trouble, not to mention that we can’t buckle our children safely in the car as it only seats 5. As we travel down the roads we are frequently dodging oncoming cars that come in the wrong lane to pass the car in front of them. It is terrifying when the whole family is in the car and we don’t feel we have a car that can “withstand a hit” from oncoming cars. The purchase of this car would provide a safe means of travel for the whole family, it is a larger bulkier car that can stand up to bullying buses, public transport vehicles and other large cars that like to bully us off the road. The car is built to withstand our Kenyan rough roads and will even have 2 available spaces for other passengers. How can you help? The price of the car is $12,100 and we currently have $5,665 raised for the purchase of the car. Will you please consider sending a tax deductible donation of any size to assist in the purchase of the car? We only have $6,435 to go!